The Progressive Gazette: FBI Visiting Gun Shops to Investigate "People talking about Big Government"
FBI Visiting Gun Shops to Investigate "People talking about Big Government"
In keeping with the tradition of the FBI’s position on gun rights, it appears the Bureau is working overdrive to monitor and harass gun owners and the gun shops that sell to them. 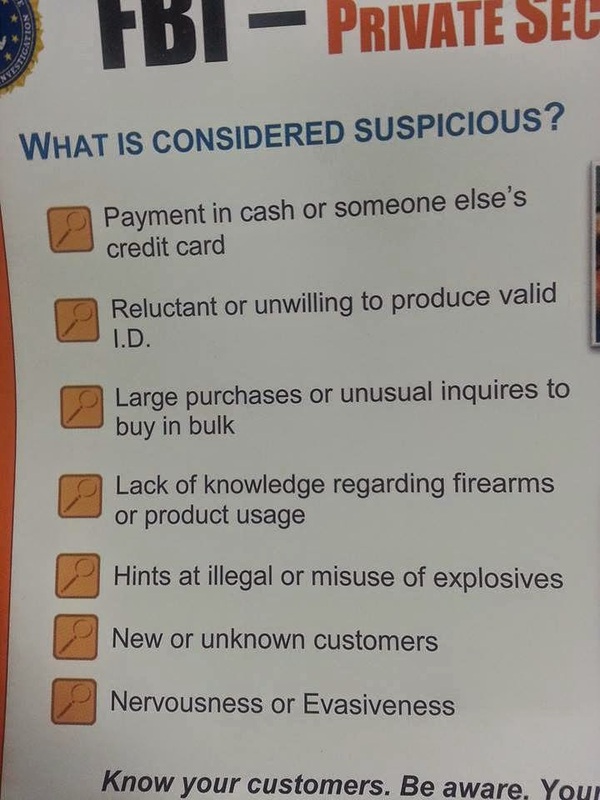 While government surveillance of gun purchases and gun owners is nothing new, a recent visit by an FBI Counterterrorism agent to a Columbia, South Carolina gun shop has only reinforced the knowledge that the U.S. government is growing more and more concerned by the prospect of a well-armed populace – particularly one that prefers to live without constant government interference in their personal lives. While the narrative surrounding “counterterrorism” operations used to eviscerate civil liberties after 9/11 was initially based upon the threat of Muslim fundamentalists, that narrative has clearly shifted to a focus on gun owning, law-abiding American citizens - both those who are politically active and those who are blissfully ignorant of current events. For many, this shift of focus has been quite the surprise. Thus, when the Columbia, South Carolina gun shop in question was approached by an FBI counterterrorism agent on Monday, April 14, the individuals who spoke with him were somewhat alarmed to realize that the agent's concern was not fundamentalist Muslims but Americans who promote small government. Is Technology Really A Threat To Jobs? Cui bono in Benton Harbor? Did CIA Director Brennan Visit Kiev Recently? Stop Reaching For Gimmicks: Take Back The Fed! Vlad the Crusader - Satire! The Progressive Gazette. Copyright 2013. Contact us at ProgressiveGazette@gmail.com. Awesome Inc. theme. Powered by Blogger.